The lower body & hips provides stability, they ground us, they keep us stable. We are generally less flexible per default in the hips than compared to say the shoulders, as it should be. But due to our lifestyle today, where we spend hours upon hours sitting down (both during “office hours” and in our spare time) and because of the fairly repetitive movement-patterns we have (walking, biking, maybe running) our hips and lower back tends to “tighten up” way too early in life. All kinds of yoga is helpful to maintain and work on your mobility and flexibility, and so can the techniques of myofascial release (MFR). Learn some easy everyday tools to relieve tightness, tension and even pain in your body, via the help of tennis balls. You will learn how you yourself can become your own massage therapist. Compliment your yoga practice through this unique way to move energy and release tension. Sometimes simply stretching just isn´t quite good enough to release tight muscles and restore the body. This is where myofascial release (MFR) techniques can be used to become aware, and then release, the tension in the body. In this workshop MFR will be combined with yin yoga poses, in order for you to come into a deeper relaxation and find more freedom in your body. You will learn some easy everyday tools to relieve tightness, tension and even pain in your body, via the help of tennis balls. You will learn how you yourself can soften sore muscles, and how to reduce tension in these stiffer areas. MFR is a great way to target specific body parts, even in inflexible bodies. This workshop is open for all, and is great for beginners as well as experienced yogis! In this basecamp, take your time exploring what may seem familiar, well-known poses but to a deeper level than perhaps you’ve experienced before. Through some trial-and-error, and a whole lot of guidance from Camilla, understand these poses and how they work in your body, so that you can access a new kind of Flex. Learn some easy everyday tools to relieve tightness, tension and even pain in your upper body & neck, via the help of tennis balls. You will learn how you yourself can soften sore muscles, and how to reduce tension in these stiffer areas. MFR is a great way to target specific body parts, even in inflexible bodies. Often props are overlooked, used incorrectly (or not used at all) which is a pity. Learn how to use them, and how that can enhance your practice, enable you to find more space in your poses, and more depth in your practice. Learn how to safely practice back-bends in Yin Yoga, and why a healthy back needs to do these kinds of movements regularly in order to remain strong and pain-free. In addition to a healthy back, the openness created around the heart-space will be of great benefit to our (emotional) wellbeing. Options will be given to suit all students, depending of your level of comfort with the postures. This Yin Yoga workshop focus on creating and finding openness and space around the chest and shoulder areas, in order to find more comfort and ease in (deeper) back-bending poses. In this workshop MFR (myofascial release) will be combined with yin yoga poses, in order for you to come in to a deeper relaxation and find more freedom in your body. 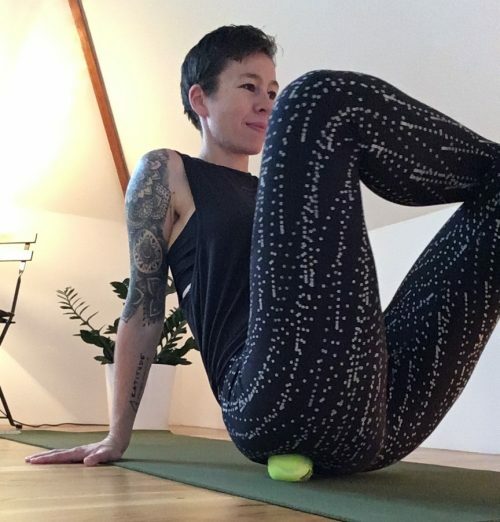 Come learn some easy everyday tools to relieve tightness, tension and even pain in your body, via the help of tennis balls, using the techniques of MFR. You will learn how you yourself can soften sore muscles, and how to reduce tension in those stiffer areas of your body. "Strap yourself in for your best flex yet!" Don´t despair, your yoga practice helps, all kinds of yoga is helpful to maintain and work on your mobility and flexibility, and so can the techniques of myofascial release (MFR). In this workshop MFR will be combined with yin yoga poses, in order for you to release and let go of some of that tension stored in your body. Learn some easy everyday tools to relieve tightness, tension and even pain in your body, via the help of tennis balls, using the techniques of myofascial release (MFR). You will learn how you yourself can soften sore muscles, and how to reduce tension in those stiffer areas of your body. This workshop focus on the upper body; the spine & neck and the arms & shoulders to help you find relief from tightness, tension and maybe even pain. Let´s face it, a lot of hours per day is spent rounding the shoulders forward as we sit in front of a computer, or look down in our phone, causing a not-so-optimal posture for the shoulders, spine and neck. Often this leads to stiff shoulders, aching lower back, tension headache and so on. In this Super Flex class we´ll work through the entire body, from bottom to the top through myofascial release (MFR) techniques. Using the tennis ball will help to release tension in your muscles, and when then staying in the yin pose, it will let you come deeper in your pose. The overall feeling from a practice combining MFR and yin (our flex) is a juicier feeling. This workshop will give you the foundations for the three common warrior poses often taught in class (hatha & vinyasa yoga alike): Warrior I, II + III. You will learn the difference between the three poses, which muscles to engage, where to relax, possible props to use, and most importantly, the correct alignment for your unique body. In yogic tradition the spine is considered as the central channel of life force, or Prana. And similarly, in Western medicine, the spine is forming the channel for the flow of nerve information from the brain to all parts of the body. Did you know that your spine (meaning your back) can move in 6 directions??! And that in order to keep your spine, and therefore your back, healthy, strong and flexible, you should move your spine in those six directions, preferably on a daily basis. Fascia is most certainly the key to a lot of what is going on in your body. Learn more about this truly amazing part of your body, and learn to understand the role of the fascia in your poses. Focus will be mainly on “tension” and “compression”. You will learn the difference in between the two, and why it is important to know whether it is tension or compression you´re feeling in the pose. You will learn to tell the difference of when it is safe to try to go deeper in your pose, and when it might mean injury if you push yourself further. Fascinating what? Join Camilla to learn about this amazing part of our body that could be the secret to you diving deeper into your poses, and discovering a whole new level of flexibility! In the yin-style of yoga (our ‘Flex’), understanding the role of the fascia can be the key you’ve been searching for to open up your body in ways you may not have thought possible. Say hello to a deeper Flex. How do you avoid injuries while practicing yin yoga? What exactly is yin yoga? Why do we need yin, isn´t all the yang versions of yoga enough? How do I get the most out of my yin yoga practice? Is yin yoga supposed to be painful to actually do any good? This workshop gives you a deeper understanding for what it is that makes yin yoga so special, and why you, as a student, need to know the difference about yin yoga and other, more active (yang) styles of yoga. You learn why you need to exercise the different parts of your body in different ways, and how, you in a safe way, practice yin yoga.